In October, GitHub announced GitHub Actions, their upcoming integrated solution for running automation triggered by things you do on GitHub. I would call it CI/CD, but that’s only part of what it can do. I’ve had beta access for about 2 months now, but didn’t really play around with it until around the Christmas period. You may already know all of this, but let’s start with a bit of background anyway. 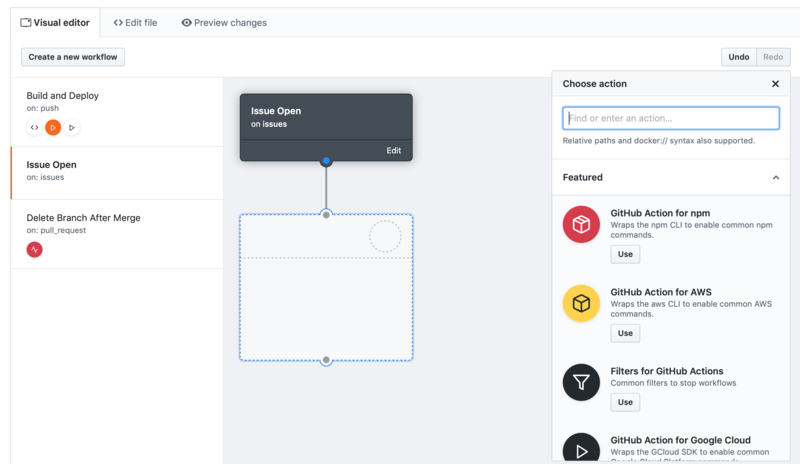 GitHub Actions lets you create workflows that consist of actions1, and they can be triggered by various events such as opening or closing of pull requests, creating or deleting branches, forking a repository, or even creating a wiki page. The number of events that can cause a workflow to trigger is a bit insane2 and it’s the main reason I don’t want to call it a CI/CD tool. That just sounds too limiting. A note on the naming as this can get a bit confusing. The feature itself is called GitHub Actions, but what you actually build is called a workflow that in turns consists of actions. I’ve noticed that people tend to mix and match the naming a bit, but in this post I’ll try to adhere to the above3. Jessie Frazelle wrote an excellent and entertaining blogpost about how a GitHub Action behaves, and I highly recommend that you read that for a concise description of how it works. I’ll cover some of the same ground, but you should really read that first. During the beta period most of the functionality is only available for private repos. 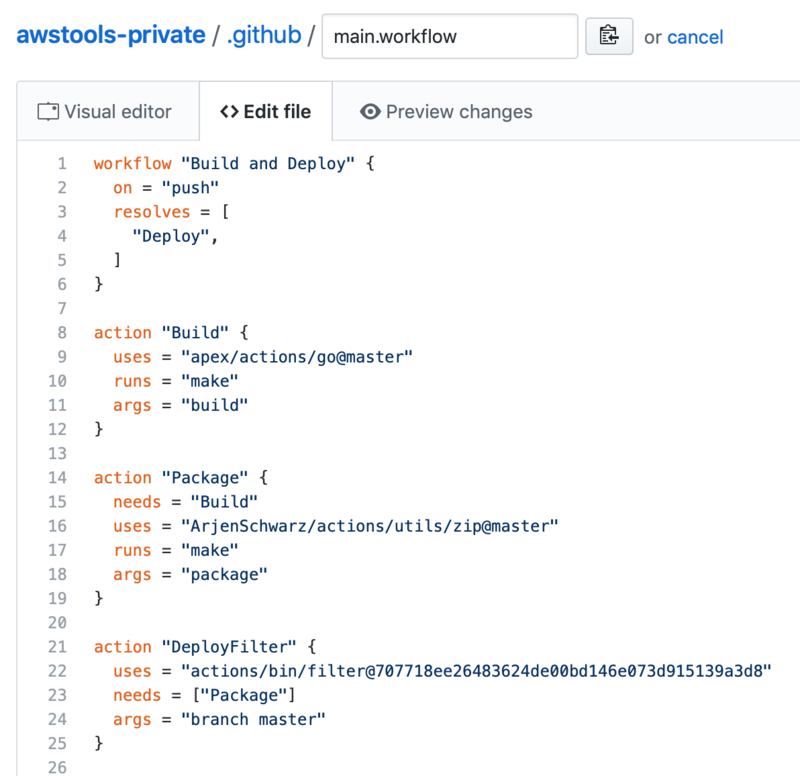 On 19 December, GitHub opened up the push event to public repos and until the recent announcement of free private repos that is what I was playing around with. As I don’t have any personal repos at the moment4, I ended up duplicating one of my public repos so I could use the full set of features. So, let’s start with building a workflow. While I generally like to use code or the CLI to configure things, the visual editor for building GitHub Actions is really good5. A nice and simple drag and drop interface that takes care of the underlying complexity for you. It starts with choosing a name for the workflow and defining what event should trigger it6. Then you can drag from this starting block to one below it to create a new action and choose what that should be. Before going into more detail on the actions, I just want to point out the section on the left in the editor. There you can see multiple workflows. These are all managed from the same main.workflow file in your .github directory, but in the visual editor they’re nicely separated. Personally, I would have appreciated the ability to have multiple workflow files for separating functionalities, but hopefully that will come in the future7. One small issue with the drag and drop interface is the way it adds actions to the main.workflow file. In particular, it always adds them at the bottom instead of grouping it by workflow. The order doesn’t actually matter so in that regard it’s not an issue, and it makes diffs a bit more readable, but it also means that your workflows can be completely spread out across a file. This is mainly an issue if you mix and match how you edit them, and of course there’s nothing stopping you from organising it again afterwards. An action in a separate GitHub repo. An action that is in the same repo as the project. A public Docker image, for example on Docker Hub9. Of these, the first 2 are basically the same except for the path. Personally I think that unless you have a very good reason, you should put your actions in a separate repository so you can easily reuse it. Using a public Docker image is certainly an interesting option as well, but playing around with it I got mixed results and just ended up using actions. Once we’ve picked our source, we can then provide secrets and environment variables or even override the runs and args of the action. These two are the values of the endpoint and command in Docker respectively. After this you just connect the next action in your chain (or a parallel one) and continue building your workflow until you’re done. Now, even if you decide to use drag and drop to build all of your workflows, I recommend looking through the source code as it reveals a couple of things and how they work. In the below example I’m using the same file I was editing above. You may notice a couple of interesting things in here. First, while I didn’t mention it above, you need to define the version of the action you wish to run. Usually you would pick @master, but this is GitHub so you can also pick a branch, tag, or even a specific commit. Looking closely you can see that I generally used @master, but for the filter action10 I dragged it in from the featured actions so GitHub gave me a commit specific one. I completely agree with doing so for featured actions as it prevents a malicious actor from changing the action. In fact, in general it’s probably a good idea to use something that’s not master unless you trust the source. The syntax itself is simple and clear, but takes some getting used to as it flows backwards. The workflow resolves the final nodes11 and each of these nodes will then say what it depends on, or needs. It’s a clean way of dealing with parallel paths and means that the position in the file isn’t important. But let’s look a bit closer at the actions themselves now. In essence an action is a Docker image, but you don’t have to push it up to a repository. All you need is a Dockerfile. And I mean that literally, the smallest action I’ve created consists of only a Dockerfile that installs what I need in the container12. Generally you will need more than that though, and the recommended way is to have an entrypoint.sh file that is used as the default command. While actions are expected to have a default entrypoint and command, you can always override that. So you may build or use an action that by default will run a certain command, but if you have a Makefile in your project that has the command ready to go it might be easier to use that instead of typing it out again in your workflow. So, if you don’t need to provide built Docker images you’ll likely realise that this gets built at the time an action runs. This makes it a bit slower, although the builds are pretty fast, but if that’s not fast enough you can of course just use images. Having it compile only on run does mean you might want to be a bit more careful about using :latest in your FROM statements or exactly what version of a dependency you’re installing. Unsurprisingly, one of the biggest strengths of GitHub Actions is its integration with GitHub. By default you can provide every action with a GITHUB_TOKEN secret that the action can then use for any interaction with GitHub that may require authentication. I’m sure you can think of ways this can be useful, but as an example I use it in several of my actions to use the GitHub API to find the latest version of an application and pull that in. Yes, you can do that without authentication, but then you quickly run into API rate limits which is never fun. And all of this also means that you can easily fork or copy every action you find and make your own version of it. Of the actions I’ve made, most are inspired in one way or another by another action. Some are straight copies with a small change, while others may only use similar structures. Send a message to the company’s #security Slack channel to ask for a review. Keep in mind here that this PR probably won’t trigger GitHub Actions to run as GitHub Actions can’t trigger other GitHub Actions. Or if you’d like another idea, how about a workflow that triggers a wiki page to be updated when you release a new version of your project? Or the other way around? In all honesty, I wouldn’t be surprised at all if someone has already written actions that do some of these things. If you don’t have access yet, you might not be aware that right now it’s not possible to see any GitHub Actions in other accounts. Obviously you can see their main.workflow file, but not the history of the runs. I don’t know if this is a beta limitation or a security feature13, but it means you can’t see what is being run. They do show up in the status checks of Pull Requests, but other than that it’s invisible. Usually you’ll have different paths you want your workflow to take based on the branch that triggered it. A common case is that you want to test your code in every branch but only do a deployment from master. This can be achieved with the filter action I referred to earlier. The filter is part of a set of actions provided by GitHub in their actions organisation, specifically it’s part of the actions/bin repository. The filter action uses a third state14 that is defined as neutral in GitHub Actions. This is triggered by exit code 78 so you can use it to implement your own filters as well. When this state is triggered it will cancel all following actions in the chain, marking them as Neutral. This is different from marking them as failed15, and is therefore useful to ensure actions are only triggered in some cases. I recommend reading the README file to see all the ways you can use the filter. The actions/action-builder repo holds several tools aimed at helping you build and test your own actions. Use those. They will make your life easier. Pick fun colours and icons for your actions. You have some control over what it looks like in the UI so there’s no need to limit it to the default. Aside from being more fun, it also helps in being more recognisable. Learn from others. Many excellent (and less so) actions have already been written and they’re worth having a look at to see how it all works. Someone created a list already and while it hasn’t been updated recently, the pull requests have more. Play with these, use them, or copy them as a basis for your own actions. It’s been almost 3 years since I wrote a similar piece about Bitbucket Pipelines and I ended up with a wish list of things I wanted to see improved16. Where it comes to GitHub Actions I don’t have a list like that. All the things I generally want are available and work really well. Oh, I can say that I would really like the full capabilities in public repos, but I suspect that’s currently because its still in beta. One small downside I can mention is that there’s no way to trigger a build manually. In practice that’s not really a concern though. GitHub Actions is super flexible and you can turn it into anything you want17, and personally I have moved everything over from Wercker18. The biggest questions I’ve got are around availability. Will this become available to everyone for free? Will there be limits based on your account type19? Questions like that. I’m sure that answers to these will come in time though, so for now I recommend to have fun when playing this new cool toy. Let me know if I missed anything obvious, or if you have any questions, and I’ll do my best to answer them.